Health Maintenance on Space Station. J. S. Logan, NASA Johnson Space Center. Abstract: Space station mission success is highly dependent on maintaining inflight crew health and safety. Medical support for extended manned missions must include capabilities for prevention, diagnosis, and therapy in all phases of the mission: pre-flight, inflight, and post-flight. Design and development of an adequate inflight health care delivery system, real time environmental monitoring, physiological countermeasures, and medical rescue and recovery of an ill/injured crewmember will present unique challenges to aerospace physicians, scientists, and engineers. Bone and Muscle: The Structural System in Long Duration Space Missions. Paul Buchanan, NASA Kennedy Space Center. Abstract: Losses of bone mineral and muscle mass have been observed, and in varying degrees measured, following all long duration missions in space. These observations portend an unacceptable threat to the crews’ ability to return to Earth, without protracted rehabilition, following periods of a year or more in microgravity. The impact to crew capabilities and productivity in space is not well understood. Past research has dealt with bone loss and muscle atrophy as two separate problems with little discernible relationship. This paper reviews the available information on both and suggests a combined structural approach for future research. Cardiovascular and Other Dynamic Systems in Long-Term Space Flight. David A. Tipton, NASA Kennedy Space Center. Abstract: Man-in-the-loop will be a crucial part of many of the aspects of space manufacturing. An understanding of the physiological abilities and limitations of man are vital in the preparation of a space manufacturing system. This paper examines the physiology of the cardiovascular system, and to a lesser extent the endocrine, renal, and hematopoietic systems. The paper highlights the aspects of these areas that are most pertinent to space manufacturing, i.e., working in space. Areas covered include the physiological costs of working in microgravity and partial gravity (e.g., the Moon or Mars), countermeasures to potentially adverse physiological adaptations, and problems associated with return to Earth after long periods of weightlessess. Reconsidering Artificial Gravity for Twenty-first Century Space Habitats. Peter H. Diamandis, M.I.T., Harvard Medical School. Abstract: The paper examines the medical rationale for artificial gravity and reviews past investigations into the optimal rotation velocity and habitat radius. The paper also proposes new directions for research in the field of Artificial Gravity. Closed Ecological Systems — Transplanting Earth’s Biosphere to Space. Clair E. Folsome, University of Hawaii. Abstract: Our laboratory of exobiology at the University of Hawaii has demonstrated that complex microbial materially closed ecologies will persist for periods exceeding 20 years; we have shown that such systems are equally as efficient in their use of sun energy as is our terrestrial ecology, and that stability can be defined and measured by experimental methods. An Introduction to the Intensive Agriculture Biome of Biosphere II. Linda Leigh, Space Biospheres Ventures and Kevin Fitzsimmons, M. Norem, and D. K. Stumpf, University of Arizona. Abstract: Biosphere II is a one-hectare materially closed, energetically and informationally open ecological system of seven biomes (tropical rainforest, savannah, marine, marsh, desert, intensive agriculture, and human habitat) being designed as a scientific and management tool for ecological research applicable to the biosphere of the Earth and regenerative life habitats in space or on the Moon or Mars. This paper discusses the Intensive Agriculture Biome which has an area of 2,069 m2 and a volume of 35,456 m3. System design is based upon local environmental conditions in Oracle, Arizona, and a cropping scheme to provide recommended dietary allowances for eight adults over a two year initial closure period has been developed. Water and nutrient recycling, soil mix and development, integrated pest management, and use of expert systems and computer models are discussed. Energetics of Closed Biological Life Support Systems. Susan Doll and Rocco Fazzolari, University of Arizona. Abstract: Energy requirements for the biological components (specifically the plants) of a biologically based life support system in a spatial environment such as the Moon or Mars are quantified. Particular focus is placed on the biological components with regard to establishing the energy needed to sustain them. For plants the primary demand is from transpiration and photosynthesis, though other related energy and work requirements are mentioned. It is found that the energy required for transpiration and photosynthesis are of the same magnitude. However, the combined demand is not the sum of the two. Although not examined in detail, other biological processes such as bacterial degradation for waste recycle and air contaminant control are included. An Electrocatalytic Waste Processing System for Closed Environments. Patrick M. Dhooge, Delphi Research, Inc.
Abstract: A system and process is described which oxidizes organic waste materials in aqueous media at 100-150°C utilizing an EC electrochemical catalytic reaction. The oxidation rate of the organic compounds is further increased by the use of a homogeneous cocatalyst. The product of the organic oxidation is principally CO2 with small amounts of impurities whose levels are dependent on the nature of the waste material. The electrocatalyst solution is regenerated by the anode of an electrochemical cell, wherein hydrogen is produced at the cell cathode. The hydrogen can be burned in a fuel cell to produce water and sufficient power to operate the electrocatalytic cells, or it may be utilized as a propulsion fuel element. Results of experiments with various model compounds, wood chips, cattle manure, and sewage sludge, will be presented, including analysis of gaseous products, solution and solid residues, reaction rate constants and activation energies. A nominal fifty-person waste processing unit now being constructed at Delphi Research, Inc., will be shown and the plan for its testing and evaluation described. Expert Systems — Tools to Help Open the Space Frontier. William H. Ganoe and A. Terry Bahill, University of Arizona. Abstract: Expert systems will be quite useful for reducing the workload of space pioneers. This paper discusses expert systems and their application to life support systems in space. Rather than being extremely rigorous, it introduces expert systems to people in a broad range of disciplines, including biological and environmental sciences, who are interested in contributing to the development of expert systems as tools to assist in opening the space frontier. But, whatever the role of expert systems in space, humans will ultimately provide the expertise incorporated into these computer programs, and humans will bear the ultimate responsibility for the decisions based on the output of expert systems. Low Earth Orbit Space Farm. Stephen Bull, Nils Bruun and Randolph Liebelt, Medaris Industries. Abstract: The paper proposes a modular low earth orbit space farm which combines the current CELSS technology with a single launch, artificial gravity space vehicle to provide fresh produce to a nearby space station crew in a balanced exchange for their biodegradable waste and carbon dioxide. While growing a substantial amount of produce, the space farm will also be developing the plant propagation technology for transfer to future lunar colonies and to accompany long range space missions, ie. interplanetary exploration. The components of the space farm will be launched by conventional booster, then manned, assembled and operated by a crew of two. Since the space farm is habitable during all stages of development, the shuttle rendezvous to deliver the crew will be brief. Adding modules will facilitate increasing crop yields. Where There Is No Vision, the People Perish: Strategic Implications of the Challenger Disaster. Gary L. Oleson, National Space Society. Abstract: The Report of the Presidential Commission on the Space Shuttle Challenger Accident (the Rogers Commission) showed an American space program badly in need of renewed purpose. Behind the technical faults and human errors that were the immediate causes of the accident was a failure to create a proper mission for NASA after the Apollo program. There was no vision of space exploration and development as a major national interest, and the over-sold and under-funded space shuttle was the only survivor of what once was a bold space plan. Last year’s report of the National Commission on Space, Pioneering the Space Frontier, made a first step toward filling that vacuum by declaring a vision of humankind moving “outward from Earth as a species destined to expand to other worlds.” This vision reflected the desires of hundreds of citizens who spoke or wrote to the Commission and polls have shown widespread public support for vigorous progress in space. There is little sign, however, of the strong Presidential leadership which is the traditional vehicle for the realization of such visions. The question remains, will the public constituencies for space provide the necessary leadership from below to open a real frontier in space? The Overview Effect: A Study of the Impact of Space Exploration on Individual and Social Awareness. Frank White, Human Systems Incorporated. Abstract: This paper discusses the changes in awareness caused by spaceflight in astronauts, cosmonauts, and society as a whole. The paper reports findings based on interviews with sixteen people who have been in space as well as an examination of secondary materials. The Overview Effect is defined as viewing the Earth from space and experiencing its inherent unity as a whole system. In addition, other changes in awareness are described, as are the conditions producing the shifts in perception. A series of propositions is offered as the foundation for continuing research into the philosophy and psychology of the new civilizations now being created on Earth and in space. Crew Factors in the Design of the Space Station. Judith L. Robinson, NASA Johnson Space Center. Abstract: This paper discusses some of the interior architecture design concepts which were developed during the definition phase (Phase B) of the current Space Station effort. The application of these concepts will help to accommodate on orbit outfitting of the Space Station, on orbit reconfiguration and eventual growth of the Space Station. The successful implementation of these concepts will result in an effective and efficient work environment, as well as a comfortable living environment for the Space Station crews. Space Station Tool Kit. William Lewis, University of Washington, Dwight Wahlberg, S.I.O., and Archie Breeden, DRT Research. Abstract: It is possible that a module replacement strategy cannot provide complete coverage of all faults on a space station. The alternative strategies are component level repair and improvisation. The feasibility of these latter strategies partially depends on the mass and volume of the tool kit needed to effect them. This paper contains some initial speculations on the contents of such a kit. The kit is intended to demonstrate the existence of very general purpose tools for component level and improvised repair, and to give the reader some feel for what would be involved in executing such repairs. The Space Phoenix Program — A Progress Report. T. F. Rogers, The External Tanks Corporations. Abstract: The Space Phoenix Program is a private commercial-industrial program which addresses the long-term goal of seeing the Earth’s space opened up to the general public. It intends to do so by beneficiating the in-orbit external tanks (E.T.s) of the Shuttle fleet so as to turn them into “Spartan” safe, sanitary and durable habitable structures whose volume will be made available for lease. It expects to do so at such a low unit lease price as to encourage their use by large numbers of people for a large number of diverse in-space activities. It is doing so by drawing upon the interests and capabilities of over fifty universities in active cooperation with the Federal Government. The Program’s initial objective is to provide the world’s first private, general purpose, scientific research facility in space: a “Labitat”, in which scientists will work and reside. The organizations, activities and progress of the Program are described. A Concept for Manned Variable Gravity Facilities. J. Alex Gimarc, U.S. Air Force. Abstract: This paper will discuss the needs for and the configurations of an early space platform that will provide artificial gravity. The platform will be a tethered dumbbell capable of rotation to provide artificial gravity levels up to 1-G Earth normal with reasonable rotation rates. The facility should be able to provide life support and living quarters for a number of inhabitants, and should allow the study of the long term effects of various ‘G’ levels on the human body, plants and animals. It also may be able to minimize those problems by providing a 1-G habitat for crewmembers who might “commute” to and from the workplace. This type of facility should be affordable, manned and operational in a minimum number of flights. It should also be capable of expansion to provide living quarters for those involved in large scale space manufacturing and construction projects. The Economic Impact of Extraterrestrial Medicine upon the Space Enterprise. Erik T. Paterson, University of British Columbia. Abstract: After the military-industrial complex, the largest component of the U.S. economy is the medical. The recent large expansion in this component has not been paralleled by the expected improvement of the general health of the U.S. population. Extraterrestrial Medicine (ETM), the use of the Space environment for the management of human disease, has been shown to have great promise for the prevention, treatment and rehabilitation of disease, particularly chronic. The probable effect of this on the economies of the U.S. and the other developed nations are discussed. It is also shown to have a probable major stimulating effect on the migration of humankind into Space. Creating Commercial Space. Greg Barr, National Space Society. Abstract: A review of the background, publicity and criticism surrounding the Commercial Space Incentive Act (CSIA) since its creation in May of 1986 with concluding remarks on the need for a new national space policy encouraging the privatization of space transportation. A summary and the complete text of the proposed legislation are included. Funding the High Frontier — A Different Approach. S. David Eisenberg, Consultant. Abstract: Sometimes two problems are each other’s solutions. The two problems to be addressed are capital formation for space resource utilization (High Frontier) and long term funding of demographically problematic pension and insurance programs (Social Security). An ordinary venture capital model of High Frontier funding is inappropriate and misleading, but a capital formation mechanism exists that would suffice for the tasks at hand were it not obstructed by short-sighted laws; legal and economic reform are therefore important. Taxes singled out for change are those on interest and dividends, capital gains, inheritance, income, and pensions. Non-tax areas to be changed are patent and copyright laws, age of majority for autonomous investing, and public capital good accounting and funding. Space Development and the American Experiment: A Context and Model for International Progress. Joanne Irene Gabrynowicz, The Human Side of Law. Abstract: The American Experiment and space development are related by a common element: one has manifested and the other can manifest, an awareness of inherent connectedness among conflicting parts by identifying the relationships between constituent parts and a whole. Once identified, these relationships give rise to principles which can be used to create coherent economic programs. Space development also requires that issues regarding the productive, peaceful use of modern science and technology be addressed. This paper looks at the model devised by the American framers of the United States Constitution, the science they used, their design process, and the resulting system. It also considers the use of the systems principles that have been successful in the American model and currently available resources in law, technology, nature, commerce, popular awareness and politics to create a global space development governance system. The new context for the model is the development of space and long-term, international human missions. Space Law and Government: A Generation Later. James E. Dunstan: Haley, Bader & Potts. Abstract: In 1963, Andrew G. Haley, former President and General Counsel of the American Institute of Aeronautics and Astronautics published what was then, and still is today, one of the major works on Space Law, entitled Space Law and Government. The present paper attempts to place the developments in Space Law in historical perspective by reviewing what Haley said and predicted in that work, what has developed in the area of Space Law since 1963, and what the key issues in Space Law are likely to be in the coming decade. 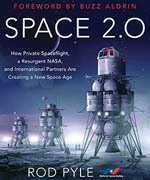 It is predicted that although Haley saw the critical need for international regulation of space activities, the self-interests of spacefaring nations, as well as the beginning of private uses of outer space, will result in a continued shift from regulation of space activities by international treaty to regulation by private contract and bilateral agreement, but that eventually, international mechanisms for dispute resolution will be required in the form of an additional international agreement. Laser Propulsion to Earth Orbit: Has Its Time Come? Arthur Kantrowitz, Dartmouth College. Abstract: Recent developments in high energy lasers, adaptive optics, and atmospheric transmission bring laser propulsion to realization. Perhaps more important, the need to transport much greater tonnages to orbit for commercial purposes, the space station, and for military purposes is now clear. A part (e.g. half the space station supplies) of this traffic could be orbited in small packages. Accordingly a workshop on this possibility was held at Livermore National Laboratory in July 1986 and this paper leans heavily on its results. This paper proposes a reference vehicle for study which consists of payload and solid propellant (e.g. ice). A suitable laser pulse is proposed for using a Laser Supported Detonation wave to produce thrust efficiently. It seems likely that a minimum system (10 Mw CO2 laser & 10 m dia. mirror) could be constructed for about $150 K. This minimum system could launch payloads of about 13 kg. to a 400 km. orbit every 10 minutes. The annual launch capability would be about 683 tonnes times the duty factor. Laser propulsion would be an order of magnitude cheaper than chemical rockets if the duty factor was 20% (10,000 launches/yr.) and launches beyond that would be even cheaper. The chief problem which needs to be addressed before these possibilities could be realized is the design of a propellant to turn laser energy into thrust efficiently and to withstand the launch environment. A Microwave Powered Orbiting Industrial Park System. William C. Brown, Microwave Power Transmission System. Abstract: The President’s Commission on Space in their published report, “Pioneering the Space Frontier” referred to “orbiting industrial parks” as one of the potential future developments in space. The concept of orbiting industrial parks with their potentially large physical size and demands for large amounts of power is compatible in many respects with the currently existing technology of microwave power transmission at a frequency of 2.45 gigahertz that often needs large receiving apertures and large amounts of power transfer to be cost effective. This paper describes a system that is equatorial-plane based because it is only in this location that satellites come back directly over the transmitters) that beam power to them each time they orbit the earth. The full scale land based system has 14 transmitters that together send power to the industrial parks with a total duty cycle of from 20 to 25%. The transmitter and receiving apertures have been sized at 40,000 m2 to project an overall efficiency starting with 60 cycle power on the ground and ending with DC power from the rectenna of 25 to 30%. A DC power output of 16,000 kilowatts at the park has been assumed. Projected 10 year cost based on 14 transmitters and a single park was $2.50/KWH including 60 cycle energy charge. The projected 10 year cost for a single transmitter and single industrial park was $8.00/KWH. Provision for energy storage is necessary if a high degree of energy leveling is desired throughout the orbital period. Electrodynamic tethers as a possible solution to energy storage and propulsion is briefly discussed. The paper describes in considerable detail the key transmitter and rectenna technologies to support the contention that the technology is both low cost and available now. Beamed Energy for Spacecraft Propulsion. Joel C. Sercel and Robert H. Frisbee, Jet Propulsion Laboratory. Abstract: This paper outlines the results of a brief study that sought to identify and characterize beamed energy spacecraft propulsion concepts that may have positive impact on the economics of space industrialization. It is argued that the technology of beamed energy propulsion systems may significantly improve the prospects for near-term colonization of outer space. It is tentatively concluded that, for space industrialization purposes, the most attractive near-term beamed energy propulsion systems are based on microwave technology. This conclusion is reached based on consideration of the common features that exist between beamed microwave propulsion and the Solar Power Satellite (SPS) concept. Laser power beaming also continues to be an attractive option for spacecraft propulsion due to the reduced diffraction-induced beam spread afforded by laser radiation wavelengths. The conceptual status and development potential of a variety of beamed energy propulsion concepts are presented. Several alternative space transportation system concepts based on beamed energy propulsion are described. A General Truss System for Very Large Spacebase Foundations. Anthony P. Coppa, General Electric. Abstract: The paper presents a general three-dimensional truss system (COPPATRUSS) that appears uniquely capable of satisfying the requirements for very large foundation structures in space. The currently patented system obtains perhaps the highest structural efficiency (strength/mass and stiffness/mass) possible in a general space truss. In addition it offers great architectural variety, modularity, fabrication economy, low package volume for launch, and rapid, principally automated, assembly in space. An example of an application to the Solar Power Satellite is discussed. Computational Techniques for the Self Assembly of Large Space Structures. Alan H. Barr, Brian Von Herzen, Ronen Barzel, John Snyder, California Institute of Technology. Abstract: We present a new computational technique, dynamic constraints, which is potentially applicable to the computer aided design, modeling, and control of the self assembly of large space structures. The technique models the dynamic behavior of mechanical elements, subject to geometric constraints on their final configuration. The constraints are met by applying external forces to the elements of the structure during assembly. The techniques are envisioned as being useful for calculating the strength of rocket impulses for automated docking maneuvers, for smoothly eliminating residual velocities and angular velocities associated with self-assembly, and for other applications where we wish to create homeostatic spatial relationships between space platforms and other structures. The technique will also be useful as a computer aided design tool for these applications. Improving Efficiency of Expendable Launch Vehicles in the Future Space Transportation System. Douglas A. Comstock, M.I.T. and General Dynamics. Abstract: Future expendable launch vehicles have the potential for providing valuable resources to earth orbiting facilities in addition to one-way transportation. They will have large upper stages or even be single stage to orbit, resulting in a large mass being placed in low earth orbit in addition to the primary payload. By using the material of the launch vehicle as a basic resource in orbit, the effective payload can be increased, resulting in a more efficient and less costly system. Launch costs can be reduced from $2000/lb for current systems to less than $150/lb for advanced partially reusable and recyclable launch vehicles incorporating this concept. Utilization studies along these lines have been done for the shuttle external tank, but little work has been done on applying this concept to the next generation of launch vehicles. This paper describes the opportunities available for utilization of launch vehicle resources in orbit, and the synergism resulting from concurrent design and development of the advanced space transportation system and space manufacturing facilities. Space Basing the Superconducting Supercollider. Paul Jablonka and Conrad Schneiker, The Space Industrialization Group. Abstract: We propose siting the Department of Energy’s proposed proton superconducting supercollider in space. As this is a substantial and massive project, substantial space-based manufacturing capability will be required. Among these requirements are several solar power satellites. Ownership of the production and research facilites would lie with a multinational corporation selling common stock. The funds for the purchase of the stock would derive directly from the participitating nations agreeing to cut their military budgets by 10% each year for 5 years, and to maintain this 50% cut for at least an additional 5 years. The funds liberated via this cut would be spent on space industrialization and on publically accessable research instruments like the supercollider. Lunar Base Logistics. Dani Eder, Boeing Aerospace Company. Abstract: Three types of support tasks, or ‘logistics’, for a lunar base are discussed with an emphasis on using local lunar source materials to reduce support costs for a base. Using a system of two orbiting tethers as momentum transfer devices, and lunar-derived oxygen plus hydrogen from Earth for propulsion, cargo can be delivered to the lunar surface with a propellant overhead of 5.6% of payload weight. This is 15 times less than a mass driver/OTV/lunar oxygen system and 64 times less than the all-Earth-propellant case. Local construction materials can be separated by composition by dense-gas flotation. Glass fibers and cast basalt from lunar sources can be used as construction materials. Supply of photovoltaic power during the lunar night can be accomplished by heating surface material during the day, then using the radiation from the hot regolith at night. Update on Earth to Space Electromagnetic Launchers. Bruce Roth, Orbital Transport Services. Abstract: The key factor limiting the development of Space resources is the cost of transportation to Low Earth Orbit (LEO). Electromagnetic launchers of various types have been proposed as a means of reducing this cost, but the technology required, particularly in the areas of energy storage and switching, is only now becoming available. Financing is also an issue; high fixed costs create a demand for high traffic volume if a launch system is to be commercially viable. Lunar based launchers or mass drivers for delivering raw materials to LEO are an attractive option in that system requirements such as payload mass and velocity are greatly reduced, but the problem of bootstrapping remains. Earth based launch systems, while technologically more challenging, are attractive in the financial sense, offering reduced risk and quicker return on investment. This paper reviews the history of these concepts and the studies done to date with particular emphasis on the coaxial systems proposed by Gerard O’Neill and Henry Kolm. Recent advances in the critical areas of switching, storage, magnetic materials and hypervelocity projectiles are discussed and one possible launch system is described. The Role of Small Solid Rocket Boosters in a Next Generation Cargo Vehicle. Barry A. Matsumori, General Dynamics. Abstract: This paper discusses the need for small solid rocket boosters as a key component in a Next Generation Cargo Vehicle. Several launch vehicle concepts have been proposed and a distinction between the concepts involve the particular solid rocket booster used to augment a liquid propellant core. The definition of “small” solid rocket boosters will be presented in the paper. The use of these small boosters has obvious advantages from almost all aspects of launch vehicle design. Cost savings and benefits are realized in the form of better “assured access” to space, reduced ground operations labor, enhanced system safety, modular payload capability and a host of other benefits. Drawbacks include a small development cost penalty and additional launch mount complexity. An overall analysis concludes that small solid rocket boosters are the logical choice for a Next Generation Cargo Vehicle. Potential Applications of Phase Conjugate Resonator Concepts. Graham S. Galloway, Scotter Research and Developments. Abstract: The explosive nature of chemical based rocket propulsion tor spacecraft has forced a search for alternatives. A preliminary mathematical excursion into the field of light pressure to integrate the technologies of Solar/Laser sails, laser resonators, and optical Phase congugation at Laser Thermal Propulsion Intensity levels leads to the presentation of laser propulsion concepts, using solid state, passive, reusable working surfaces on spacecraft to impart a force to such a spacecraft, of over 65 newtons per operating meter of panel surface by the conservative resonant reflectance of a 1 megawatt/cm2 incident laser beam (10 gigawatt/m2). The special Laser resonator (the phase Conjugate Resonator and its associated materials and optics) is shown to reduce the difficulties associated with the overall concept of Laser Resonator propulsion. The concept is applied to External Tank reuse, Orbital debris clearing, and as a aero braking alternative. Some advantages and disadvantages of the component systems and materials are discussed, followed by thoughts on the use, hazards, and long-term potential of the general concept. Other applications in Solar energy, Nuclear energy, Agriculture, and Interstellar travel are presented. The question of the true nature of light and its ability to transfer Momentum in concepts designed to conserve energy while maximizing momentum transfer leads the Author to some tenative Space Drive proposals using recent advances in concepts, materials, and devices. In conclusion the concept merits ongoing evaluation as suitable materials and laser technology become available from other developments on the forefront of technology. The Electric Rail Rocket. Brian Tillotson, Space Research. Abstract: The electric rail rocket, a first stage propulsion concept for launch to orbit, is described. The performance and cost of a point design are estimated. Advantages and disadvantages relative to other launch systems are discussed. A Systems Architecture of Extraterrestrial Production. H. H. Koelle, University of Berlin. Abstract: The advance of space technology in general and the operation of space laboratories in near earth orbits in particular, have led to successful experiments in material processing under microgravity conditions. It also has become clear that the production of lunar oxygen would greatly improve the cost effectiveness of space transportation systems. Thus, it appears the time has come to define a frame-of-reference, including the functions and elements of extraterrestrial production activities which are expected to take place in future space stations and space factories. This report discusses potential product groups, identifies the functions to be performed and the system elements required. The interrelationships between both are illustrated. An attempt is made to show the expected evolutionary development of extraterrestrial production with the help of contextual diagrams and scenarios. This report contains 10 pages, 15 figures and 16 references. Lunar Base Options in Support of the Permanent Habitation of Space. Kyle Fairchild, NASA Johnson Space Center. Abstract: Clearly, we are rapidly approaching the establishment of permanent human presence in space. Much of the traditional thinking about going to and living in space needs to be assessed. New ideas and perhaps new institutions will be needed. The NASA recognizes the need for these new relationships. This recognition is reflected in a recent workshop jointly sponsored by NASA, Los Alamos National Laboratories, the Jet Propulsion Laboratory, and the Large Scale Programs Institute. Representatives from the public and private sectors met to discuss potential joint development of new space technologies. In the final analysis, given a modest success orientation and a national commitment to space, independent, self-sufficient settlements in space should exist within the lifetimes of most people now on Earth. The Possible Role of a Remotely Operated Lunar Base as an Interim Measure to Advance Space Development. David L. Barrett, Windom, TX. Abstract: A remotely operated base, established during the early 1990′s for the purpose of building and operating biological and engineering laboratories on the Moon, could provide access to lunar resources ten to twenty years before a manned lunar base becomes economically feasible. Research conducted at the base might include studies of the growth and development of plants and animals in lunar gravity, the evaluation of industrial equipment designed for use on the Moon, the manufacture and testing of products derived from lunar materials, and the development of techniques for lunar construction. The components of the base would weigh substantially less than components designed for a manned installation, permitting their delivery to the Moon by launch vehicles currently available for commercial use, or by other more economical vehicles which may be available in the 1990′s. A phased development sequence, based on separately operable modular components, would facilitate the cooperation of multiple participants in the planning, finance, and operation of the base. The scale of base activities could be small enough to permit their implementation independently from the National Aeronautics and Space Administration, although the full potential of the base could not easily be realized without NASA’s participation and support. Silicon, Aluminum and Oxygen from Lunar Ore. Rudolf Keller, EMEC Consultants. Abstract: A process scheme to produce silicon, aluminum and oxygen from lunar anorthite is presented. In a dry-extraction process, silicon will be obtained by reduction of the ore with aluminum metal, subsequently aluminum and oxygen by molten salt electrolysis. Conceptual and experimental work is progressing at EMEC Consultants with the support of NASA’s SBIR program. Physical Properties of Concrete Made with Apollo 16 Lunar Soil Sample. T. D. Lin, H. Love and D. Stark, Construction Technology Laboratories, Inc.
Abstract: On March 6, 1986, the National Aeronautics and Space Administration (NASA) awarded Construction Technology Laboratories (CTL) with 40 grams of lunar soil. The award was made based on a CTL proposal to NASA that lunar soils and rocks could be used as concrete aggregates and as raw materials for manufacturing cement and water. These ingredients could then be used to produce concrete for the construction of lunar bases. This paper describes the first phase of the long-term investigation for the construction of concrete lunar bases. In this phase, petrographic and scanning electron microscope examinations showed that the morphology and elemental composition of the lunar soil made it suitable for use as a fine aggregate for concrete. Based on this finding, calcium aluminate cement and distilled water were mixed with the lunar soil to fabricate test specimens. The test specimens consisted of a 1-in. cube, a 1/2-in. cube and three 0.12 x 0.58 x 3.15-in. beam specimens. Tests were performed on these specimens to determine compressive strength, modulus of rupture, modulus of elasticity and thermal coefficient of expansion. Based on examination of the material and test results, it is concluded that lunar soil can be used as a fine aggregate for concrete. Unmanned Scientific Mission to the Asteroids. G. E. Canough and L. P. Lehman, ExtraTerrestrial Materials, Inc.
Abstract: The paper describes a scientific mission to survey and rendezvous with the asteroids and a second follow-up mission which will perform a sample return. Each mission involves the use of a mother-ship and a smaller, more maneuverable robot daughter-ship. The first scientific survey mission will rendezvous with two or more asteroids, perform a detailed analysis at each asteroid, and leave behind a small transponder instrument package. The second mission will provide some degree of redundancy to the first mission, but is primarily intended to obtain a sample of its primary target asteroid and return it to earth. While enroute both missions will carry out astronomical survey functions to catalog the position and orbital parameters of both known and unknown asteroids by using on-board visible and infrared (IR) telescopes. Accessibility of Near Earth Asteroids for Resource Exploitation. Andrew Hall Cutler, Energy Science Laboratories. Abstract: Simple formulae have been determined which accurately predict the propulsive requirements for ideal mission opportunities to near earth asteroids with perihelia greater than 0.95 AU. These formulae could be combined with models of the probability distribution of asteroids in orbital element phase space to determine the number of new asteroids which must be discovered for there to be a given probability of finding an asteroid with a certain accessibility. The deviation of real mission opportunities from ideality is discussed for several accessible asteroids. It is found that, in general, ideal minimum propulsive and travel time requirements are substantially lower than those which can be obtained in any practical case. Celestial mechanics is inferred to selectively perturb near earth asteroids out of orbits with particularly good practical mission opportunities. Carbonaceous Chondritic Asteroids, The Ideal Extraterrestrial Resource. David L. Kuck, Geological & Mining Consultant. Abstract: Carbonaceous chondritic asteroids are ideal early targets for extraterrestrial exploitation. They contain biogenic resources, water, hydrocarbons and water soluble metal salts. The water and soluble salts can form the basis of wet chemistry. In addition, structural material sources in the form of metalic silictes and oxides which can be reduced to metal with the help of the hydrocarbons. Cl-chondrites also contain magnetite Fe3O4, an easily reduced iron oxide. The hydrocarbons are finely divided and dispersed throughout the chondrites, which will allow direct reduction of iron upon heating. Xenoliths, which are present in many meteorites, may provide a variety of other meteorite compositions, both chondritic and achondritic which may be treated with the materials derived from the carbonaceous chondritic asteroid. The first step in treating carbonaceous chondrites is to wash them thoroughly with water, acid and/or alkaline solutions to recover soluble salts. The next step could be to retort the washed chondrite to recover the wash and chondritic water, then upon further heating recovery of other volatiles and finally partial reduction of iron by the remaining hydrocarbon. The retorted chondrite can then be comminuted and treated magnetically and/or electrostatically to separate minerals. The various mineral concentrates may be treated by pyro and/or wet chemical processes to obtain desired products. Any earth-approaching carbonaceous chondritic asteroids, Phobos and Diemos should be primary targets for exploitation. Phobos and Diemos may have the same problem encountered on the Moon, that is the loss of volatiles due to collision heating, since they are deep in the gravity well of Mars. Fresh unheated carbonaceous chondritic rock is needed with all or most of the volatiles. Later, the main belt carbonaceous chondritic asteroids and dark asteroids should be targets for exploitation. The Economics of Mining the Martian Moons. 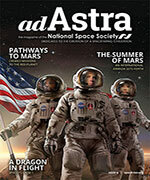 Raymond S. Leonard, Ad Astra, Ltd., James D. Blacic and David T. Vaniman, Los Alamos National Laboratory. Abstract: There are a number of reasons for going to Mars: scientific research, national prestige, exploration, and as a focus for advancing science and driving technology. There may also be an economic reason for going to Mars if the US and/or other nations decide to pursue a permanent and expanding role in space more extensive than the currently planned US space station. In this case, the possibility of finding volatiles such as water, carbon, and nitrogen on the Martian moons, Phobos and Deimos, could justify the expense of exploration by significantly reducing the long term cost of operations beyond low Earth orbit. This paper estimates the costs for extracting and shipping any volatiles that might be found on Phobos and Deimos. These costs are compared to the cost of shipping those same volatiles from Earth. We assume the use of nuclear powered mining facilities and freighters. The major factors in this analysis are: 1) the types of resources that might be available on Phobos and Deimos; 2) the cost of extracting and returning those resources to low Earth orbit (LEO), geosynchronous Earth orbit (GEO), Lunar Orbit or to transportation nodal points such as the L-l (Lagrange) Earth-Sun or Mars-Sun locations; 3) cost comparisons with similar material brought from Earth, and 4) the type and size of the market for raw materials imported from the Martian moons. Secondary products in addition to water and other volatiles include bulk materials for use as shielding which could double as structural components for deep space facilities and vehicles. Evaluation of these factors suggests that a Phobos manufacturing capability may develop before manufacturing begins on the Moon. Major uncertainties in the economic analysis are: interest rates, launch costs, rate of return on investment, market size and the rate of market expansion. 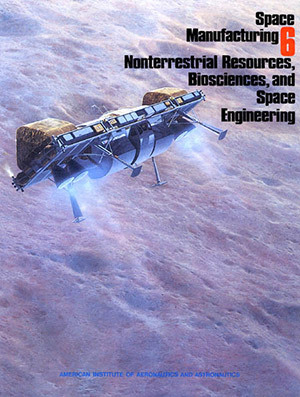 The conclusions are: 1) it would be commercially viable to mine the Martian moons, (i.e., a profit of at least a 10 percent return on capital could be realized); 2) most of the technology needed to mine Phobos and Deimos is already developed; 3) extraterrestrial sources of propellants for ion propulsion systems are needed to lower the cost of transportation; and 4) mining the Martian moons would reduce the cost of exploring Mars as well as the cost of space operations near Earth (out to the orbit of the Moon). Mars 1999: A Concept for High Leverage Water and Fuel Processing on Phobos and Deimos. Brian OíLeary, Science Applications International Corporation. Abstract: In the previous SSI/Princeton Conference on Space Manufacturing, I presented a concept for a near-term human mission to Phobos and Deimos for resources and science. During 1986-87, research carried out under contract with the NASA Marshall Space Flight Center has permitted a more detailed description of such a mission that could be carried out as early as 1998-99. The new work includes: (1) conceptual design of an interplanetary spacecraft that would allow for either cooperation or competition with the Soviets; (2) the use of the space shuttle external tank as a booster from low Earth orbit and as a fuel storage tank at Phobos/ Deimos; (3) volatile processing concepts that permit life support restocking, a manned sortie to the Martian surface, and fuel stockpiling for revisits; and (4) description of the thorough exploration of Mars by means of a network of rovers, balloons and orbitors controlled primarily by astronauts on Phobos/Deimos. The dovetailing of political, economic and scientific benefits of Mars 1999 makes this an attractive option for early consideration by the President and NASA. The concept opens the way to bootstrapping nonterrestrial resources into a rapidly growing space industrial infrastructure during the decade following 2000. Specifically, three follow-on missions could deliver about 10,000 metric tons of Phobos/Deimos water to the vicinity of Earth by 2005 to fuel equipment launches to a lunar base, Mars Base, and asteroid mining base. Use of a 2-Meter Radius Centrifuge on Space Station for Human Physiologic Conditioning and Testing. Peter H. Diamandis, M.I.T. and Harvard Medical School. Abstract: My research investigates three novel uses for a 2 meter radius “human-compatible” centrifuge (called the (AGS) Artificial Gravity Sleeper) aboard the space station. 1) Conducting lower limb exercises while rotating on the centrifuge, thus providing conditioning stresses to every physiological system of the body — thereby going beyond what is currently achievable with inflight exercise protocols. 2) Sleeping during centrifugation thus passively stressing the body and opening a significant amount of work time (2-4 hours) for other uses. 3) Using the facility as an analytical tool for testing an astronaut’s physiological condition. A Description of the Expandable Platform. Joseph J. Mangan, A.I.A., New York. Abstract: There will eventually be a need for a special expandable structure that will act as the matrix for all scientific and engineering advances that are now developed and are soon to be developed as we prepare to habitat and utilize the moon, Mars, and the asteroids. After the preparatory exploration on the moon is completed and the placement of the first minimal base is established and temporarily occupied, it will be necessary to call upon and use a totally new and different structural system that will make use of mapping from luna-synchronous orbit while incorporating a multitude of points on a triangular grid that will set the optimum placement on a platform to form a permanent base (lunar or planetary). Also, this special structural system, aided by computers, will determine the optimum location of high speed interconnected transport lines between such bases and similarly this system will be used to provide for the inclusion of launch and land platforms. This discussion will show how the expandable platform, initially designed for earth, is translated for use on the moon and Mars and how it answers a multitude of problems while it incorporates special lunar and planetary bases and their high speed transportation systems. Remote Servicing of a Solar Power Satellite. Michael J. Massimino, The Massachusetts Institute of Technology. Abstract: Servicing a Solar Power Satellite (SPS) in Geostationary (GEO) orbit is a challenging and necessary capability. Remote servicing would greatly aid the successful implementation of an SPS. In this paper, the characteristics and benefits of remote SPS servicing are discussed. A typical SPS servicing mission utilizing a low earth orbit (LEO) space station or SPS servicing base is outlined. The use of automation and teleoperation to augment the cognitive abilities of human operators provides many benefits but controlling a remote servicing operation could involve major transmission time delays. To alleviate some of the performance degradation associated with such time delays recommendations are made for using supervisory control with predictor displays. Overall conclusions and recommendations based on the analyses and information presented are included. Lady Base One Corporation and the Market for Space Development. W. F. Mitchell Jr., Lady Base One Corporation. Abstract: The paper outlines the business plan and market opportunity for Lady Base One Corporation, that is the business of space development and the perceived market for products and services resulting from the establishment of permanent mining, manufacturing, and research facilities on the Moon and in near-Earth space. A Job Shop for Space Manufacturing. J. W. Stryker, Sunderland, MA. Abstract: Space habitation will create a need for a general purpose repair, rebuilding, and manufacturing facility. The self-contained “job shop” concept fits this need. A single, multi-purpose machine tool combined with a large variety of accessories is proposed. This uses existing and proven technology, requiring only some minor adaptions for work in space. Also, there is a large experience base of job shop techniques which can be drawn upon. A job shop can modify tools and equipment already in orbit. It can perform production manufacturing for many of the sub-components needed in the construction of additional habitats. This adaptability also provides valuable capacity when Shuttle or other transportation links may experience delays. It creates a “bootstrapping” capability which can significantly lower manufacturing costs in space. This paper presents specific design aspects which can help achieve this goal.